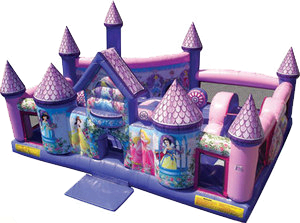 This Princess Palace Large Combo Design Bouncer toddler playground is a Disney Princess attraction that will have everyone in awe. Little princes and princesses are greeted by Jasmine, Belle, Cinderella, Sleeping Beauty and Snow White, and then enter a royal gemstone-adorned playroom! Kids can choose from several different activities, including a climb and slide, obstacles and pop-ups, or they can play a counting game with gemstones or naming the princesses. Honored guests can enter the special cornered off jump area, for hours of enchanting fun and exercise!This Disney Princess Palace is Awesome..very interactive for your little princess.It features an inflatable safety ramp at the entrance to protect excited kids as they scramble to get inside the bouncer. It also has large netted vent windows that keep things cool for the kids and allows parents to keep a watchful eye on all activities inside. Appox 6-8 users at a time.